This article is about the vehicle from Diddy Kong Racing. For Funky Kong's similarly-named vehicle from Donkey Kong Country 3, see Hover Craft. Diddy and T.T. race in Hovercrafts in Pirate Lagoon. 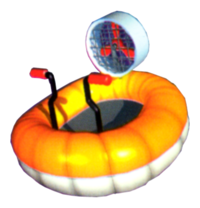 Hovercrafts are one of the three vehicles in Diddy Kong Racing and Diddy Kong Racing DS. Their main attribute is the ability to float across bodies of water, including lava. They are the default vehicle of those stages, which are the main theme of Sherbet Island. It is the only hub world where the character drives around in a Hovercraft. These vehicles can be driven in every stage except for some boss fights and battle stages. Hovercrafts are considered to be the trickiest vehicle to control, mainly because of poor steering capabilities. In the Nintendo DS remake, players can initiate a Rocket Start by blowing into the DS's microphone. In the original Diddy Kong Racing, every character's Hovercraft had its own color, just like Cars and Planes. In Diddy Kong Racing DS, every character's Hovercraft is yellow by default. However, from Taj's Wishes Menu, the player can change its color along with adding more customization options to it. This page was last edited on April 2, 2019, at 22:42.